interview - painted fish studio. Please introduce yourself and tell us a little about your shop. How did you come up with the shop name Painted Fish Studio? Hello! I’m Jen Shaffer and my Etsy shop is called Painted Fish Studio. I make handmade books and goods with paper and Polaroids. In college, I became drawn to fish as a decorative element, and I’ve never been sure why. At that time I created a little business called “Painted Fish Art & Design” and I made greeting cards, and hoped to also use the name for graphic design work when I graduated from college. But when I graduated, I jumped into a career in IT and abandoned my creative work for about 6 years. When I realized I needed a creative outlet, “Painted Fish” came back but I changed the last part to “Studio” which felt more fluid. 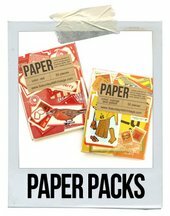 Your shop is filled with lots of fun paper goods - handmade journals, jotters, and cards. Have you always been a fan of paper? Yes! I grew up on a hobby farm without a TV, and we spent our indoor time drawing and reading books. When I was 10 I created cards and started a little store in one of our farm’s outbuildings. I even created catalogs that my gramma ordered from! Making paper goods for retail has always been in my blood. 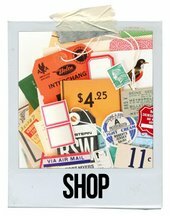 Your cards and magnets made from your Polaroid photos are some of my favorite items in your shop. How do you choose the subjects for these photos? Thanks! : ) When choosing Polaroids for cards, I first go to my favorites, and then from there I scrutinize my choices: Why would someone send this out? Is it because of a color or color combination? Is the subject matter interesting? Would I personally send it? When choosing which Polaroids to use for the magnet sets, I usually have 10-15 Polaroids I’m selecting from, and my focus is on creating a collection that works together as a whole. The individual magnet needs to be compelling (example: it must be a recognizable landmark if it’s a set of city magnets) but all of them must look like they’re meant to be displayed together. Sometimes it takes days to narrow down the choices! Where do you make most of your products for your shop? Do you have a little nook tucked away somewhere in your house / take over your dining room table / have a room dedicated to your crafts? I do the majority of my work in my dining room, which has the best natural light and open space. I have a big table to spread my work out on, and I create little piles of projects. It’s steps away from the kitchen which is handy when I need running water when working with glue. I keep my tools on the table all the time, but everything is easy to sweep up if I want to eat or entertain on it. Where do you seek inspiration for creating new designs and new products? How do you get yourself out of a dreaded creativity rut? I try not to force new ideas to come, because when they don’t I get frustrated. Many of my ideas generate when I’m out walking my dogs: it’s the only time in my day when I am unplugged and my mind can wander freely. When I’m in a creative rut, I ride it out. I try not to be hard on myself, and when I’m not coming up with new ideas I take that as a sign to step back and do other things: read, rest, relax. Thank you, Jen! Please be sure to check out Painted Fish Studio's shop and blog! great interview! i love jen and her work. they're both so clean and fresh :)!